In 1937, the “Builder Bishop”, died leaving a diocese of 800 priests ministering to 602,000 Catholics. 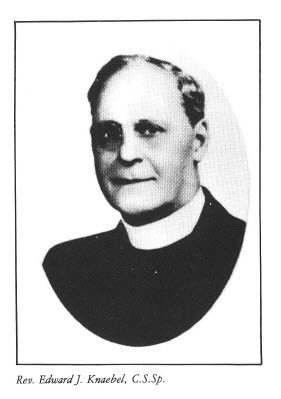 Bishop Gallagher was succeeded by Edward F. Mooney, and the Archdiocese of Detroit was then established with Grand Rapids, Lansing, Marquette, and Saginaw dioceses in Michigan as suffragans of Detroit. Serious financial problems followed on the heels of the Depression and the period of extensive building which had incurred a heavy archdiocesan debt. But within the first few years of his episcopate, Archbishop Mooney refinanced the debt and established the annual Archdiocesan Development Fund to institute new buildings and programs. Over one hundred sites were purchased for future development. Archbishop Mooney organized the many lay groups of women into the Detroit Archdiocesan Council of Catholic Women. And he asked the Holy Ghost Fathers at St. Mary’s to tend to the spiritual needs of the patients and staff at Detroit Receiving hospital, located just a block away. Daily routine visits and emergency calls – at any time of the day or night and in all weather – were added to the good Fathers’ apostolate. In February, 1940, Father Hoeger was called to Cornwells Heights, Pennsylvania, as Mission Procurator and Director of the Holy Ghost Seminary. Succeeding him at St. Mary’s was Father Edward J. Knaebel. 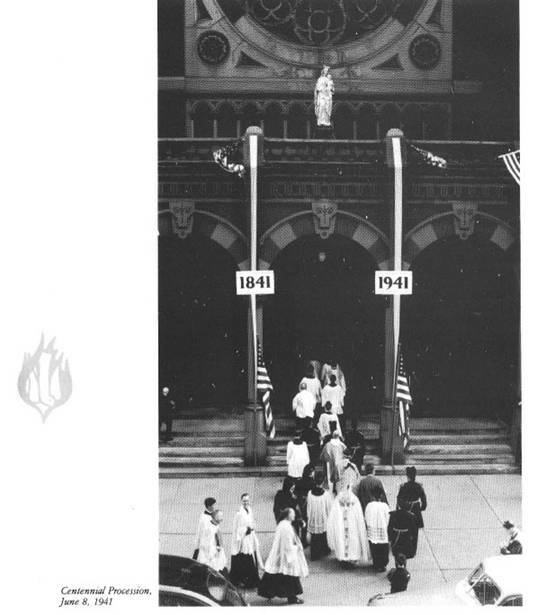 On June 8, 1941, Archbishop Mooney presided over the Centennial Mass, attended by 2,000, commemorating the cornerstone blessing of the parish’s first church building. The celebrant was the Very Revered E. Allors, C.S.B., pastor of St. Anne’s Church (then in its 240th year). Redemptorists and Franciscans assisted Father Allors at the mass, including Father Henry Schutter, C.SS.R., of Holy Redeemer Parish and Father Alexander Wilberding, O.F.M., of Duns Scotus College. Other participants were two priests who were brought up in St. Mary’s and who said their first masses at the altar here. The Right Reverend Monsignor Henry Kaufman, chaplain of St. Mary’s Hospital, was archpriest, and Father Francis X. Kuhn, C.SS.R., of Holy Redeemer Church, spoke. He recalled that when he was graduated from the parish school exactly 50 years ago, he served as an altar boy at the golden jubilee, and the 75th anniversary, a quarter century ago, he served both as priest and speaker. For this occasion, the church had been completely renovated and redecorated. The main altar, constructed by the Redemptorist Brothers for the first church, was restored to its original lines and became the white and gold focal point of the new ornamental scheme designed by Conrad Schmitt Studios of Milwaukee. A new system of indirect lighting was said to give “a sunlight effect” over the main and side altars. The oldtimers were there – some almost as old as the church itself, like the Chateau sisters, both over 90. There were younger people, too, many of them well known in public life, whom the church had sought to serve in special ways in recent years through the daily noon mass and special devotions. They included judges and attaches from the nearby Recorder’s Court, nurses and physicians from Receiving Hospital, and members of the police department from their headquarters, just a block away. This Sunday service, which was only the first of a week-long celebration, was closed with the apostolic blessing of Pope Pius XII, given by the Archbishop. When you come into St. Mary’s edifice you will feel a hallowed sensation and confidence that your prayers will be heard. The beautiful structure is mellowed with love and devotion, for within its walls some of the finest services in great splendor were held in the hey-day of the then German neighborhood. Go into the church, turn directly left, see the life-size Crucifixion setting. Again turn left into the Garden of Gethsemane where you will observe Judas accepting the 30 pieces of silver, Peter, James, and John as asleep while a lovable Christ is undergoing His Agony and praying to His Heavenly Father. Notice the expression in his eyes. You will have a heavy heart. Many people’s eyes begin to moisten as they consider His Great Agony and Suffering for us. Now go up the aisle to the front. Note the excellent Stations of the Cross; marvel at the big solid granite pillars with such beautiful capitals. Look up on the walls and feast your eyes on the exquisite paintings depicting the fifteen Decades of the Rosary and the Seven Sacraments. Observe the paintings in the ceiling; The Immaculate Conception and several titles of the Blessed Virgin Litany. The stained glass windows of St. Aloysius, also The Annunciation are gems. The niche of The Sorrowful Mother with the lifeless body of her Divine Son on her lap, also the paintings of The Coronation and The Holy Ghost being sent to the Missionaries, are points of interest. Then returning toward the rear of the church you will see the Grand Rose Window over the mammoth organ. In the sunken grotto the Baptism of Christ with Water is portrayed; and it is here that babies and many adults are baptized. The Grotto of Lourdes will capture your fancy. You will really feel that the Blessed Mother is near you. You will kneel at the pre-dieux and pour out your heart to Mary. By all means study the small panels erected on the wall by Lourdes Grotto, these are material expressions of gratitude to the Blessed Virgin Mary for extraordinary favors received. A number of people claim that miracles have been wrought to them because of their prayers to Mary there. Yes, we do believe that Mary loves this Temple of Worship and that she listens extra well here. Oh how you can pray here and you will love it. Mary’s Rosary, The Memorare, The Hail Mary are all very wonderful and richly indulgenced. Before you leave, gaze on the paintings over the entrances of both grottos. One is The Holy Trinity on the day of the Last judgment; above this is plaster in bas relief of Adam and Eve being driven out of Paradise. The other picture is the Sacred Heart of Jesus taking the suffering souls out of Purgatory. Many people who come to Detroit for a visit, and are directed to this magnificent church, really write home about it. Detroiters who go to this House of the Lord for noon-day Mass or Confession, all say, “I love that church and the generous services the Holy Ghost Fathers always extend”. How true this still is!